A starlit backdrop set the stage for the 12th annual FUNraising Gala at the Beverly Hilton in Beverly Hills, CA. 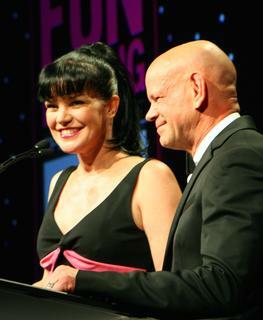 Co-hosts Pauley Perrette of NCIS and Winn Claybaugh, dean and cofounder of Paul Mitchell Schools, introduced the 11 charities and their representatives, including John Paul DeJoria (Food 4 Africa), Magic Johnson (Magic Johnson Foundation), Fran Drescher (Cancer Schmancer), Marie Osmond (Children’s Miracle Network Hospitals), Gary Sinise (Gary Sinise Foundation), Dolph Lundgren (CAST, the Coalition to Abolish Slavery and Trafficking), Kathy Buckley (No Limits), and Seth Maxwell and Eden Sassoon (The Thirst Project). In addition to revealing the grand total raised, the event also acknowledges the top 10 FUNraising schools and other major contributors, such as the Advanced Academy educators who donate their time and talent to the campaign, and the winners of the annual “First 100” contest. For raising at least $3,000 individually, these students and staff members attended the Gala and “meet and greet” photo op plus a day of hands-on education with Paul Mitchell Editorial Director Lucie Doughty and international educator Fumi Eguchi. Paul Mitchell Cofounder and Chairman John Paul DeJoria acknowledged the schools’ longtime support for Food 4 Africa, an organization close to his heart. He also introduced Earvin “Magic” Johnson to talk about the work done by his Magic Johnson Foundation. “Thank you for being there for all of us, caring about this world, wanting to make a change in this world,” Magic said. “Thank you, thank you, and thank you from the bottom of my heart.” To date, the schools have donated $780,000 to Food 4 Africa and $530,000 to the Magic Johnson Foundation. Referring to his new movie, The Skin Trade, actor Dolph Lundgren said, “I have two daughters, 13 and 18, and I had to get into the space of how would I feel if those were my daughters. . . . I started thinking, How can I help out? . . . I want to thank you guys for helping CAST. You make a huge difference!” To date, Paul Mitchell Schools have donated $100,000 to CAST. In their after-school programs for deaf and hearing-impaired kids, No Limits helps children develop language through tools such as their theme-inspired cowboy and jungle classrooms. “Now we have the most important room ever,” said comedian and motivational speaker Kathy Buckley. “The Paul Mitchell room! Our kids are going to learn a whole new language about nails and hair and shampoo.” To everyone’s delight, Kathy welcomed three adorable guest speakers. “These kids just started this year and they had no language,” Kathy said. “Ashley, do you have something you want to say?” Ashley replied, “Do you want to have a haircut?” To date, Paul Mitchell Schools have donated $666,575 to No Limits. Thirst Project founder Seth Maxwell and Eden Sassoon, daughter of Vidal Sassoon, spoke about the global water crisis and how the FUNraising campaign can help. “This is the most incredibly generous, loving, warm community and family of people in the world,” Maxwell said. “You have a chance to make a radical difference in someone’s life and you’ve done that.” To date, Paul Mitchell Schools have donated $125,000 to the Thirst Project. Fran Drescher described a new program made possible by Paul Mitchell Schools’ support. 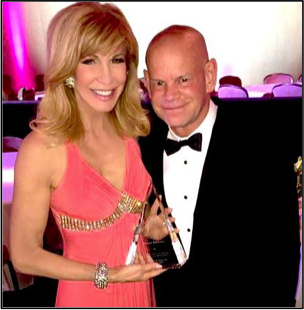 “With your help, you’ve given us wings to pursue our Detox Your Home program, which is so important, and especially for young people.... It’s fun, it’s informative, and it helps kids start thinking about what foods they’re eating.” To date, Paul Mitchell Schools have donated $680,000 to Cancer Schmancer. Speaking on behalf of Children’s Miracle Network Hospitals, cofounder Marie Osmond said, “Every minute, 62 children enter a children’s hospital …. These miracles happen because of your passion and dedication to help and save these beautiful babies’ lives. We are honored that you support us and I am honored to be in this room full of magnificent hearts.” To date, Paul Mitchell Schools have donated $1.1 million to Children’s Miracle Network Hospitals. Habitat for Humanity partner homeowner Yvette Nelson described her journey and shared her story. A recovering addict with 19 years of sobriety, and a mother of three who lost one son to homicide, she now works for a Skid Row organization that helps people with mental illness and AIDS. “I’m really grateful that I’m going to live the American Dream,” she said. “Life is okay. It doesn’t matter where you are; it’s how you live it. Habitat for Humanity has been awesome to me. …. It’s not a handout, it’s a hand up.” To date, Paul Mitchell Schools have donated $370,000 to Habitat for Humanity. Representing the foundation bearing his name, Gary Sinise appeared with U.S. Army Staff Sergeant Travis Mills, a wounded hero who lost both of his arms and legs while on active duty. “Freedom is a precious, precious thing and there are sacrifices being made every day for that freedom we all enjoy,” Sinise said. “We could never do enough for the men and women who defend and serve our country; we can always do more, and that’s what you’re doing here at the Paul Mitchell Schools.” To date, Paul Mitchell Schools have donated $510,000 to Gary Sinise Foundation. Actress Betty White has attended several Paul Mitchell Schools’ FUNraising Galas on behalf of Morris Animal Foundation but was unable to attend this year. She sent a video message, saying: “I’m sorry I can’t be with you tonight, but I want to say thank you from the bottom of my heart … for supporting Morris Animal Foundation and all of the worthy causes that benefit from your generosity.” To date, Paul Mitchell Schools have donated $620,000 to Morris Animal Foundation.